Do you have the stones to pit your wit and skills against a deadly opponent in hand to hand combat? Do you have the speed of a falcon, the strength of a lion, and the cunning of a fox? Test yourself in the card game Yomi, a 2-player card game that attempts to emulate a street-fighter style martial arts competition. You’ll need to hit your opponent fast and hard, but you’ll also need to read your opponent and guess their next move, or you may find yourself on the wrong end of a knockout blow. 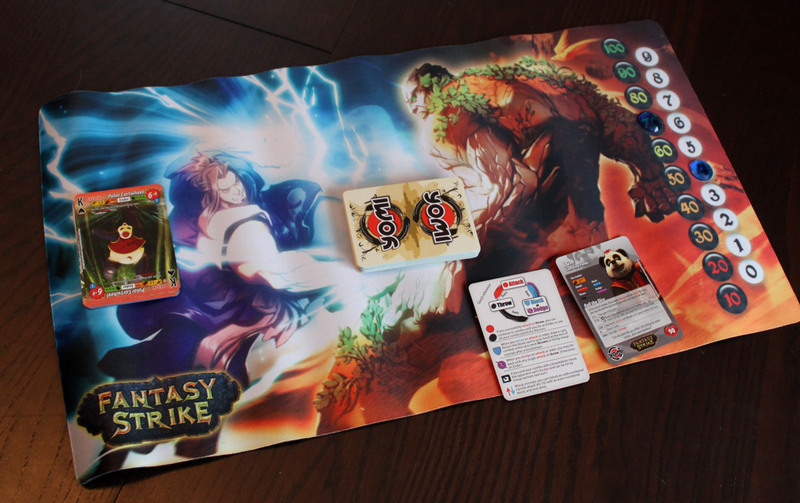 You may recognize the setting, as this game is based in the Fantasy Strike universe, sharing the scene with such games as Puzzle Strike and Flash Duel. 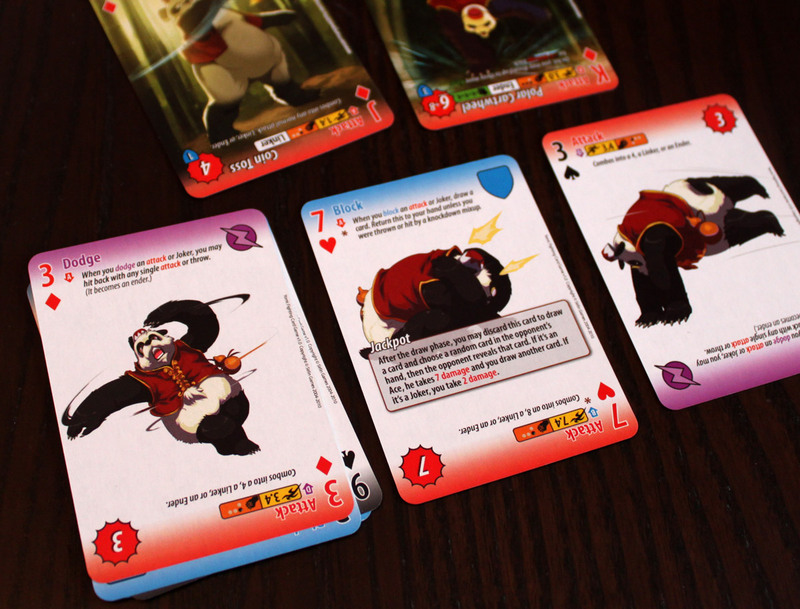 In Yomi, each player has a set of cards corresponding to one of the 10 characters. Each set is equivalent to a standard playing card deck, with an extra Character card and Rules card. Of course, in Yomi the cards feature character art and cards have extra stats and special abilities. 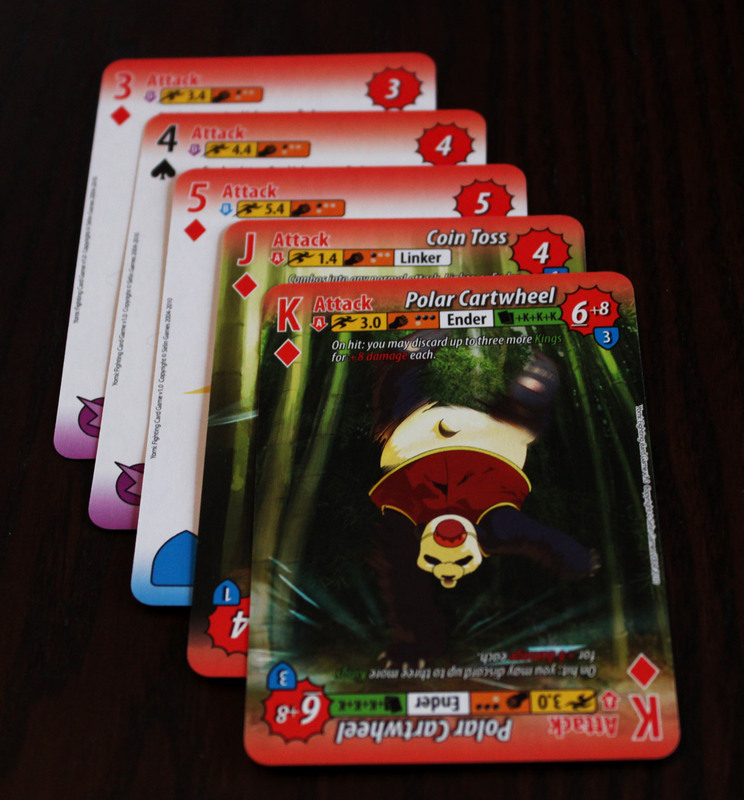 Players start with 7 cards in their hand. Each turn, players draw 1 card, then simulatenously choose 1 card to play. When both cards are chosen, they reveal their cards. Combat is resolved in a rock-paper-scissors manor. That is, Block/Dodge beats Attack, Attack beats Throw, and Throw beats Block/Dodge. If players both play attacks or both play throws, whoever played the attack with the highest speed wins. If they both play dodges, nothing happens and they continue on to the next round. A player who succeeds with an Attack or Throw can start a Combo. Normal attacks can be combo’d in sequence (that is, if you play a “3” attack you can combo a 4, then a 5). The face cards (J, Q, K , A) have tags indicating if they are “linkers” (can be played at any point in a Combo), Starters (can only start a combo), and Enders (Can be played at any time during a combo, but ends the combo). However, a Combo isn’t a free reign to lay on the damage. Each character has a combo limit. In addition, a player on the receiving end of a combo can play a face-down defensive card at the start of the combo, and reveal it when the combo is finished. If it’s a Joker, it cancels all of the damage of that combo. At the end of a turn, each player has the opportunity to discard sets of cards from their hands to search their deck/discard for Aces, the most powerful cards. 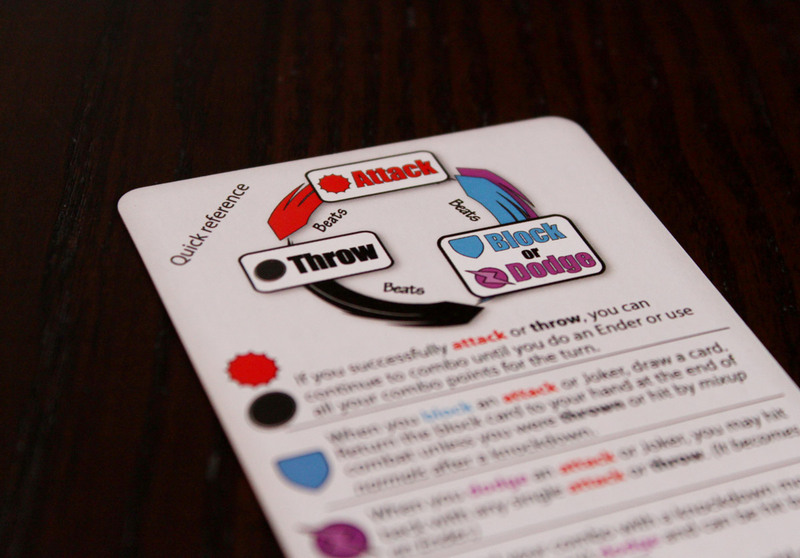 Many cards also have special abilities that allow players to manipulate their hands, gain extra attack powers, and a variety of other things depending on what character is in play. Whoever is reduced to 0 hit points first loses, and the standing player is declared the victor! As long as Yomi’s pace is kept up, it’s a pretty decent diversion and an interesting 2-player game. I always have a little trouble explaining the rules to this game quickly; it’s strange, because it’s actually a pretty straightforward game. The Rock-Paper-Scissors format is familiar, and it’s not difficult to remember what beats what, and the player aid has a nice large diagram to remind you if you forget. It just seems like there are a lot of details that are important to know before you start, details that almost seem clumsy; but once you finally get started, everything falls into place. It certainly doesn’t hurt that every card has icons to reference as well as a textual description of what it can combo into, or what happens in situations specific to that card (for example, playing a Block versus an Attack lets you draw an extra card, while playing Dodge against Attack lets you hit back with one attack card), so if you’re trying to figure out your best combo, you have a convenient reference. And the game plays very quickly; at 90 hit points, you have enough to sustain a few hits; but the hits do come strong and hard. It’s all about trying to set up a massive attack and then really laying out the smackdown at your first opportunity. These things generally take 2-3 turns or so, so like I said, the game clips along with massive hits every few turns while allowing enough leeway to come back from a rough turn. The primary decision element of the game is simply choosing which card to play. It may at first seem like you’re just picking randomly and hoping you get through, but the core mechanism isn’t really “playing a card” it’s “guessing what card your opponent is playing.” Some turns will be a toss-up, but guessing is made possible by context. Your opponent is running low on cards; will they block in hopes to draw more cards, or play an attack guessing that you’ll play a throw in hopes to steamroller through their block? But, you can’t spend too long trying to figure it out, or the game will drag. It’s meant to simulate a fast-paced martial arts contest, and you’ve got to keep the energy up. Each turn should take a few seconds; once an attack lands, you just have to decide if you’re going to do a combo or not; your hand size is small enough and combos limited enough that you won’t have a lot of options with your combos. Chances are more likely that you’ll try to build up one of your special attacks (your facecards often allow you to discard extra copies of the same card to do massive damage that doesn’t count as a combo), or discard for Aces. One thing I noticed about this game is that hand sizes tend to dwindle. Barring special abilities on cards, the only way to draw new cards is by playing a block; and then, only if your opponent plays an attack. You do have the benefit of taking a block card back to your hand if it succeeds, but if you’re running low on cards your opponent will probably try to throw you a lot so your blocks will do no good. Discarding pairs and triples for Aces is an important part of setting up bigger attacks, but you always trade down in volume. New players will frequently find themselves with only 1 card in hand to play, which really limits their options; and you can’t choose NOT to play a card, so if you can’t succeed on a block or draw a special ability that lets you draw more cards, you’re going to get stuck, which is less than exciting. That’s all the more reason to play fast and plan your attacks carefully; you want to use up your cards only when you can do something awesome, or when you can KO your opponent. You also want to play Blocks when you can BEFORE your hand size shrinks to small, so your enemy can’t trap you. The fast-paced nature of the game does evoke the street-fighter-ish theme, which is cool. There are 10 different characters (which you can purchase individually, or you can just buy the master set with all 10 characters, and you still get individual card boxes for each character), and they all have slightly different numbers of blocks, attacks, throws, etc. They also have different special abilities, different character abilities, and different special attacks. However, perhaps to keep the game balanced, these special abilities don’t change the game all that much. I didn’t feel like I had a big difference in strategy between Jefferson DeGrey, the “ghostly diplomat,” and Max Geiger, the “Precise Watchmaker.” There were a few differences, different cool powers to use on occasion, but mostly it was all about guessing my opponents moves and trying to keep my hand size up. Sitll, at least you can play with different card art, and perhaps as you explore the game more deeply, you’ll be able to take advantage of character’s abilities in more unique ways. On the plus side, you won’t need to study each character and learn obscure rules for each one. So, lets round this up. Yomi isn’t a strategic game; it’s barely a tactical one. It’s about guessing your opponents moves, or “reading” him or her to counter them perfectly. (Apparently “Yomi” is Japanese for “Reading”). It will appeal to someone looking for a fast-paced 2-player gmae with direct conflict; It’s a decent portrayal of a 2-D fighting video game for the tabletop. It has some depth you could definitely explore with the different characters and powers, and it plays very quickly. 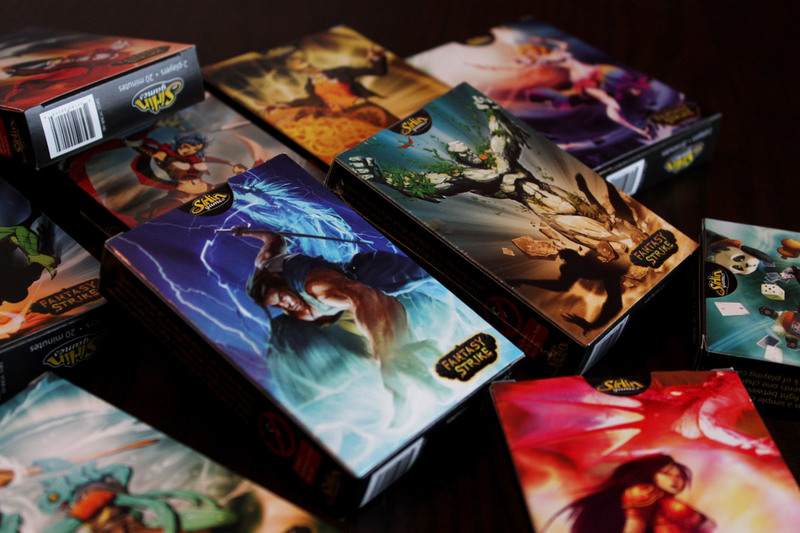 You can get individual packs or buy the whole master set, but either way you have an easy-to-learn, portable, non-collectible card game that’s pretty fun. I think you overlooked a rule. Both players draw a card at the start of each turn. Hand sizes do dwindle (and for one of the characters that is actually advantageous), but maybe not quite as quickly as you’ve experienced. Drawing 1 card serves only to replace the card you played. Thus, whenever you play a combo (or lay down a card to defend/bluff against a combo) you’re losing cards. Since that happens fairly frequently, your hand size dwindles quickly. The point is, it’s easy for your hand size to shrink to 1 card if you’re not careful, which happens to newbies. You have to know to plan ahead and Block instead of Dodge frequently in order to draw extra cards, or you’ll get stuck. I’ve played Yomi a ton since 2010, and struggled with “what exactly it is” the entire time. I’ve watched the best players playing tournament games, listened to as much commentary as any, had numersous conversations with the designer and lead playtesters, read strategy guides, beta tested the expansion, and have played probably about 1000 matches. The game should probably not be called Yomi, (which means “reading” in Japanese) because the “reading” aspect of the game is basically a lie. Like, it requires “faith” on the part of the player, or if you like, a kind of gambler’s fallacy. You need to “believe” that your reasoning for why you chose to play an attack has anything to do with the fact that it actually was a hit. In reality, it could – and frequently does – have nothing to do with your reasoning. This fact – that the yomi is not actually a thing – is made extra clear by the fact that many high level players play the game with a *random number generator* dictating to them which combat option they should play (you could have read all about that on Fantasystrike’s forums, but unfortunately the thread was deleted). Now, that does not mean that there is no skill to the game. There is actually still a lot of skill to the game, but it has nothing to do with reading. It has everything to do with the other half of playing Yomi – “hand valuation”. Maintaining power at the right times, keeping a healthy hand, playing combos, and knowing when to use all your damage potential are part of this hand valuation aspect, which IS actually a real thing, and I think represents 99% of the actual skill of the game. This is why I think the game should be called “valuation” rather than “yomi”. Unfortunately, the “yomi” part comes into play every single turn whether you ignore it or not. This means that you will get some VERY WILD swings of randomness in the outcomes of the game. For example, while I’ve played the game a ton, I have played a tiny, tiny fraction of the amount some of the best players have played – like maybe 1/100th the number of games that some of the best players have. Yet I recently had a situation where I beat one of the world’s top 10 Yomi players three times in a row in a best of 5. Maybe it’s just me, but I feel like that should never happen. I shouldn’t even win 1 out of 3 games, let alone 3/3. So, Yomi is an interesting game, but I think it’s just way too direct and random, which means that it’s really frustrating and you have to play 20 matches with someone to find out who’s better. It’s kind of like playing Street Fighter, if you were playing on a stage that was tiny, like a small box that could just barely fit Ken & Ryu, and they were doing moves point-blank at all times. Thanks for your input! Certainly your experience is different than mine. I guess I’m writing from a more casual perspective; I’m not going to be playing Yomi 1,000 times anytime soon, so it’s good to hear from someone who plays a lot. Specifically, you get to draw a card whenever your normal attack wins combat or is blocked. This should help with the dwindling hand. With all of that said, I think the assertion that Yomi is not strategic / tactical, as stated in your review is wrong. If anything, it’s just a horribly inefficient strategy game, in that it takes many plays to get reliable feedback, and it’s frustrating to play because it’s so random. But if you are the kind of person who’s good at looking past high levels of randomness, you’ll find a ton of depth in Yomi. Thank you for the review futurewolfie! I think you explained how the game works really well, and you made it an easy read. Unfortunately, by only playing a few sample of games, you have got some things wrong. While you might have *felt* there was no difference between playing DeGrey and Geiger, in fact they are strategically quite different. Which leads me to the big wrong thing; you say that “Yomi isn’t a strategic game”, as if it is a fact. This is false. Yomi is strategical, and tactical. There’s certainly the ‘reading’ aspect of the game, which players quickly find when they start playing. When you get deeper into the game, you begin to understand the different characters’ strengths and weaknesses, which allows the space for ‘strategy’. Instead of only commenting on the review, I will have to reply to Keith Burgun here, as he’s misrepresenting the game I love to such an extent I even have to question his purpose of writing such a reply. I can’t help but think he has bad intentions. Let me introduce myself. My name is Jan, and I go by the alias friiik. 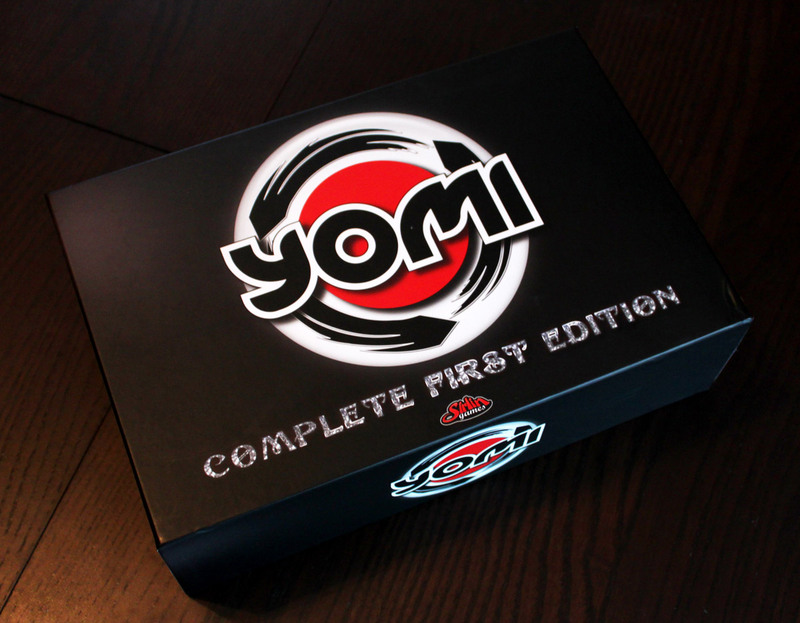 I’ve played Yomi since August 2009, when it was still in development. I’m considered one of the best Yomi players, if not the best, in the Yomi community. I disqualify all of what Keith Burgun wrote as wrong. Yomi is based on a Rock-Paper-Scissors mechanic. In normal Rock-Paper-Scissors, if you play each option 1/3 of the time, you can’t lose to any other strategy. This makes the game ‘solved’, and thus the game lacks strategy. But there are players who are good at Rock-Paper-Scissors. They are good at ‘reading’, or put differently, at pattern recognition. This element exists in Yomi, but unlike normal Rock-Paper-Scissors, Yomi is not ‘solved’. There are many ways to play the game, and different strategies to use. Therefore, when you play a move, you will have to consider your opponent’s strategy. This leads the game into the waters Keith Burgun is referring to when he writes about valuation. When you get competent at Yomi, you will spend a lot of time pondering about valuation. So much, that maybe as in Keith’s case, you will forget that beneath all the strategic depth, the core is still Rock-Paper-Scissors. It’s still about pattern recognition; there are just other things to consider as well. Further down in his post, Keith acknowledges that there is in fact ‘reading’, but somehow it’s “basically a lie”, that comes into play every single turn…quite difficult to make any sense of that. Following, he says the existence of ‘reading’ means you get big swings of randomness. Even more difficult to make sense of that. Randomness means some kind of dice element, of which there is none in Yomi. He then argues that because he beat a strong player 3-0, this serves as an example and proof of randomness. This is eyebrow raising to say the least. It just doesn’t follow at all. Just as a side-note, I find it funny that the “one of the top 10 Yomi players in the world” Keith beat 3-0 is a player who has gone over to almost exclusively use a random number generator for all his plays. And he uses that as an example for the existence of “randomness” in Yomi. Ironic, isn’t it? Before my next comment, I just want to point out something important. If you are using a random number generator, it would be equivalent to playing with an engine in chess; it’s not you who are making the moves. If you aren’t the agent of the plays you make, I don’t understand why you would play in the first place. Now, Keith argues that the use of random number generators among some good players, shows that “yomi[/reading] is not actually a thing”. This conclusion is wrong. As I’ve explained previously in this post, ‘reading’ means being able to recognize patterns in your opponent’s play. If you are using a random number generator to decide your move, you *remove* the ‘reading’ element from the game, as it is impossible to use pattern recognition to beat a random agent! Instead, one would purely have to rely on strategy. If you remove an element X from a game by doing Y, it doesn’t show that element X doesn’t exist in the actual game. Keith tried to make the false argument that it does. Also, to clarify, I don’t use a random number generator when I play, and most people don’t. Finally, I want to say that I absolutely love Yomi. It’s a fantastic game, and does its name justice. If you are interested, you can go to fantasystrike.com, and play it online as I do. I really hope to see you playing sometime soon! Thanks for your input! I can only write a review from my own perspective, and unfortunately I can’t always dive into a game as deeply as I would like before I write a review. So I guess my POV is from a more casual direction, for those who might pick the game up and play every once in a while, over someone who digs in and plays as much as you clearly have. Thanks for leaving a comment with your complete thoughts. That definitely adds more detail and a different direction of looking at the game, from someone who has played a lot. Personally, the thought of playing against someone using a random number generator to dictate their moves sounds completely unfun. I realize it might be a valid way to win a tournament (although i’m surprised there aren’t rules against it) but when I played, a big part of the fun was trying to guess what the other player was going to do. Thanks to your comment I can see how strategy plays a bigger part than my first assumption. I did say the characters didn’t seem all that different, but I also mentioned that the differences might become more clear if you dug into them and learned with more experience, so clearly that’s true. Clearly Yomi, despite its very simple structure, has a lot of depth and a lot worth exploring. thanks again for adding your thoughts! Yeah, I’m not by any means blaming you, I just felt it was important to point out that Yomi is indeed a strategic game. I have full understanding that from your point of view, it didn’t seem like it did. It’s worth emphaisizing that the very existence of top players using RNG and succeeding is indication that Yomi is a game of both reading and strategy. The reason these players use the RNG is because they’re super good at evaluating gamestates, but not amazing at reading – using an RNG frees their brainpower to analyze the game state more accurately, which is a requirement to using an RNG profitably. If you don’t weigh the different options properly, an RNG will just make you lose horribly. So it’s a different pinnacle of skill, basically. But those actual decisions require brainpower and there are players who are really good at the reading stuff – if it was irrelevant, no sense in using RNG on it right? RNG does have advantages to it – like landing Grave’s True Power of Storms for example (a truly random TPOS is super scary and really hard to deal with). But at the same time your attention is focused on gamestate analysis and assigning weights to things – a mindset and way of making decisions that are almost purely strategy and play out over multiple turns, instead of precise points in time. Thus a bit more prone to missing “he’s 100% to do this thing right here” type of situations that a reading player would notice easily if he was good. A give and take, that is. And at least currently it seems that humans are 100% competitive with RNG players, as evidenced by friiik.